Singer, rapper, and goddess, SZA, is committed to creating a sustainable future and wants you to look good while doing it too. SZA revealed her latest line of Ctrl-inspired merch on Instagram, borrowing motifs from previous collections that have featured multi-colored text and Champion branding for a clean athletic look. 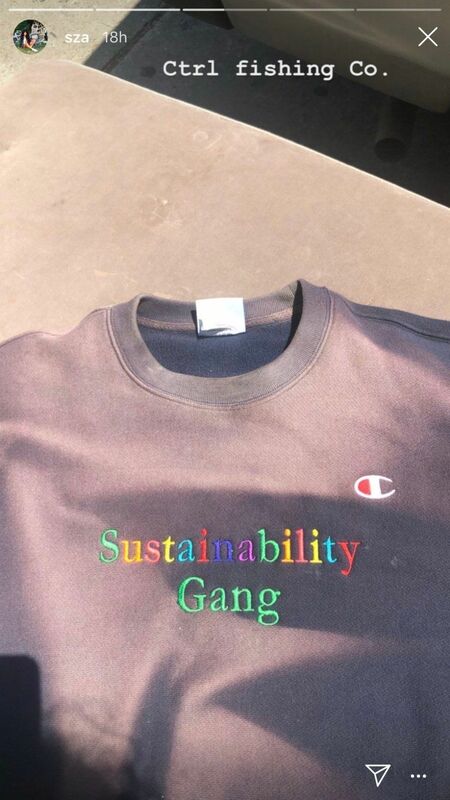 The new line includes sweatshirts embroidered with colorful sayings like "Puck Flastic" and "Sustainability Gang," as well as t-shirts and tanks with whales and seahorses. Under the umbrella of the newly formed Ctrl Fishing Co., 100% of the proceeds from the collection will go towards sustainable efforts geared at protecting the oceans. It's a noble cause, one that fashion is increasingly putting more effort into with brands like H&M and ASOS releasing recyclable lines and the CFDA renewing efforts to be more sustainable at this year's awards show.